A judge found Hosni Mubarak was an accessory to murder because he failed to stop the killing of demonstrators. CAIRO - An Egyptian court sentenced former President Hosni Mubarak to life in prison on Saturday as an accomplice in the killing of unarmed demonstrators during the protests that ended his nearly 30-year rule. But a conviction that once promised to deliver a triumph for the rule of law in Egypt and the Arab world - the first Arab strongman jailed by his own citizens - instead brought tens of thousands of Egyptians back into the streets. They denounced the verdict as a sham because the court also acquitted many officials more directly responsible for the police who killed the demonstrators, and a broad range of lawyers and political leaders said Mubarak’s conviction was doomed to reversal on appeal. Presiding over a three-judge panel, Judge Ahmed Rifaat said that prosecutors had presented no evidence that Mubarak or his top aides had directly ordered the killing of protesters. Instead, the judge found that Mubarak, 84, was an “accessory to murder’’ because he failed to stop the killing, a rationale that lawyers said would not meet the usual requirements for a murder conviction under Egyptian or international law. By nightfall, tens of thousands filled Tahrir Square in a protest that matched the size and ideological diversity of the early days of the revolt, with Islamists and liberals once again protesting side by side. Protesters poured into the streets of Alexandria, Suez and other cities to rail against what they saw as a miscarriage of justice. For many Egyptians, it was the latest disappointment in a 16-month-old transition that has not delivered the ratification of a constitution, the election of a president, and the handover of power by interim military rulers. The judges also sentenced Mubarak’s feared former interior minister Habib el-Adly to the same penalty for the same reason. But they dismissed corruption charges against Mubarak and his deeply unpopular sons, Alaa and Gamal, on technical grounds. Against an opaque backdrop of military rule, in which the generals, prosecutors, and judges were all appointed by Mubarak, the degree of judicial independence is impossible to know. Demonstrators slammed the decision as a ruse designed to placate the street without holding anyone accountable for the violence or corruption of the old regime. The ruling immediately became a political battleground in Egypt’s first competitive presidential race, expected to be decided this month by a runoff between the candidate of the Muslim Brotherhood and Ahmed Shafiq, Mubarak’s last prime minister. Most analysts called the decision a blow to Shafiq because of his close ties to Mubarak, but any further protests could increase public receptiveness to Shafiq’s law and order message. 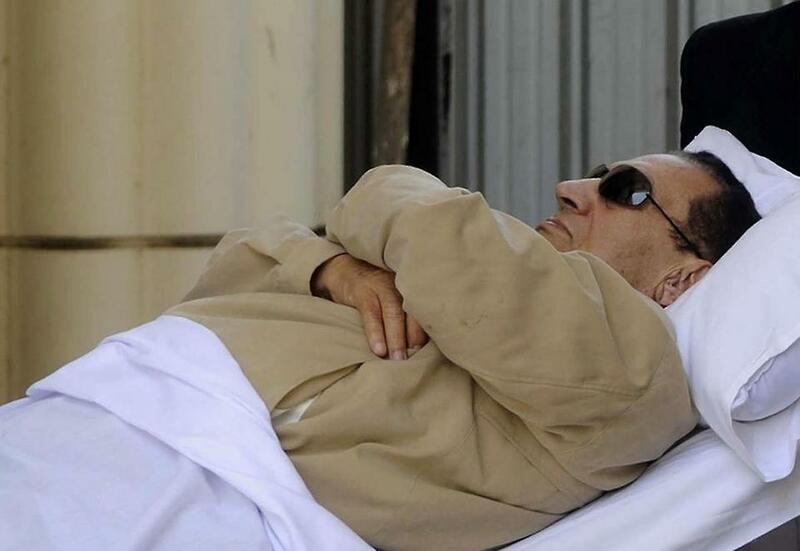 Mubarak’s conviction and court appearance - on a hospital gurney in the metal cage that holds criminal defendants in Egypt - offered the kind of vivid example of the humiliation of their onetime invincible ruler that once thrilled Egyptians with a feeling of liberation. Mubarak, in dark glasses and a light-colored track suit, showed no reaction to the verdict. Both sons stood in front of their father to try to shield him from the cameras. Alaa Mubarak appeared to recite verses of the Koran as the verdict was read. And after the ruling both sons had tears in their eyes. They remain in jail while they face charges in an unrelated stock-manipulation case announced last week. Mubarak was housed during the trial in a military hospital where he had visits from his family, according to news reports, and a daily swim. After the verdict, a helicopter flew him to a Cairo prison. State news media reported that after complaining of a “medical crisis,’’ Mubarak was treated in the helicopter on the ground, and then he refused to leave it and enter the prison for 2 1/2 hours, complaining that he needed the support of his family. The ruling appeared for the first time to bring together a broad spectrum of both liberal and Islamist political leaders in united opposition to Shafiq. By Saturday afternoon, protesters were tearing down Shafiq’s billboards and burning his campaign posters. “Shafiq you disgrace, the revolution continues,’’ protesters chanted. In a statement, Shafiq said the next president should “comprehend the historic lesson’’ of the decision. “This means that nobody in Egypt is still above punishment or accountability,’’ he added. His opponent, Mohammed Morsi of the Muslim Brotherhood, pledged that if elected he would assemble a team of top prosecutors to determine who was responsible for the killings and press new charges against Mubarak and his aides. Around 9 p.m., Brotherhood members formed two long rows so that Morsi could safely walk into the Tahrir Square crowd, then cheering supporters carried him on their shoulders.